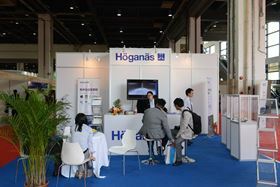 Höganäs at PM China 2015. 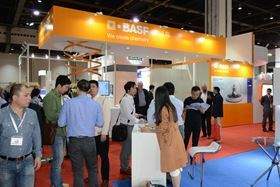 BASF at the Shanghai show. The three-day 2015 China (Shanghai) International Powder Metallurgy & Cemented Carbides & Advanced Ceramics Exhibition & Conference closed successfully as usual on 29 April at the Shanghai Everbright Exhibition & Convention Center, China. After the exhibition, visitors left with valuable information and exhibitors returned home with inquiries of intent. The forum and symposium attendees were eager to share their gains. Just as expected, the number of visitors and exhibitors of this leading event hit a new record and it is believed that the event scale and relative figures will keep growing in future events. Key suppliers in the industry were attracted and we saw more and more important industry names at the show, from raw materials to the end products. Professional visitors were busy consulting and negotiating and we saw on-site contracts signed again. On-line registration attendees were over 400, and with the attendee numbers quickly reaching the maximum capacity the room could hold, for safety purposes the organizer had to put restriction on entry at the parallel technical session. A proceeding of the symposium and forum speech will be published later. Many exhibitors have confirmed their presentation next year and we look forward to meeting you at PM China 2016, Shanghai, China, from 27–29 April 2016. 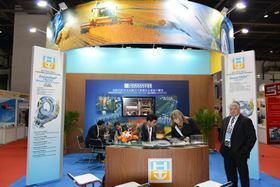 The Hoeganaes stand at PM China.